Father’s Day may have passed, but the humor of bacon as the perfect present lives on in a brilliant online video promoting Oscar Mayer’s collection of bacon. 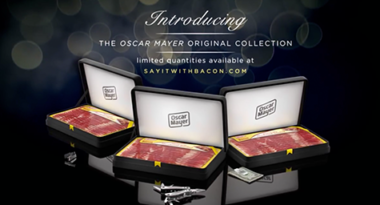 The YouTube campaign elevates bacon to the realm of fine jewelry and sings its porky praises with tongue firmly planted in cheek. The video ad plays up the “romance” of bacon with the imagery of a horse-drawn carriage and a devoted woman presenting the gift of bacon to her beloved. Then, the many facets of bacon’s beauty are poignantly described by a lover of the streaky strips. To playfully parallel the pork to diamonds, the ad expounds on the “four C’s” of bacon (that would be cut, color, consistency … and cure) with disdainful mention of “liquid smoke” imposters. For a good laugh at a great campaign, watch the video. Discover what’s new and novel in online video advertising. Contact MDG Advertising today at 561-338-7797 or visit mdgadvertising.com. MDG Advertising, a full-service advertising agency with offices in Boca Raton and New York, NY, is one of Florida’s top creative ad agencies. Our 360° approach uses just the right mix of traditional and digital marketing to reach your advertising goals. While some industries may fare better in print and others online, we strive to create a balanced approach, where traditional, digital, and social media marketing efforts support each other and your message is tailored to the medium. To learn more about the latest trends in YouTube advertising, contact MDG Advertising today at 561-338-7797 or visit mdgadvertising.com.